Welcome to the September Tour de Freaks where the theme is “BOO to You” and I took that quite literally! If you are going forward through the hop you arrived here from Margaret Raburn’s Fun Stampin’ with Margaret blog. What FUN and FABULOUS projects! For my first BOO…I just HAD to use this little ghost. It really is the CUTEST thing EVER and it is especially cute when done in Dazzling Diamonds Glimmer paper. To make the BOO on the banner I used the little letters to cut it our of the black and add a strip of the Motely Monster dsp Crushed Curry behind it using dimensionals. The eyes are done with the 1/8″ hole punch and put a Basic Black circle behind it. Otherwise I ran a piece of Pumpkin Pie through the Lucky Stars embossing folder. Don’t you just LOVE that candy cone dsp? Me too! So…I did this cute 3D using three Tiny Boxes from the Holiday Mini. I wrapped some of the Candy Corn dsp around it to hold them all today. 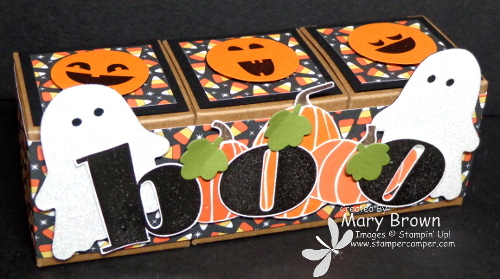 I added Basic Black and the Candy Corn dsp to the tops and stamp the faces from Fall Fest, black embossed on Pumpkin Pie then punched out using 1 1/4 circle punch. The ghosts are again made from Dazzling Diamonds Glimmer paper. The pumpkins were stamped in Pumpkin Pie, Tangelo Twist, Tangerine Tango and Early Espresso for the stems. The leaves are Old Olive. For ‘boo’ I stamped the Larger Than Life Alphabet in Versamark and Black Embossed and cut out. I just layered all this on to the wrap around the boxes for easy removal. I hope you liked my BOO to you and now it time to head on over to Melissa Davies Rubberfunatics for more Frightfully Fun ideas! This entry was posted in 3D, Holiday Mini, Tour de Freaks and tagged Fall Fest, Larger than Life Alphabet. Bookmark the permalink. Oh, these are just so STINKIN’ CUTE! Love the trio of TIny Boxes! Great job! You make crafting look so effortless! I love everything you do! 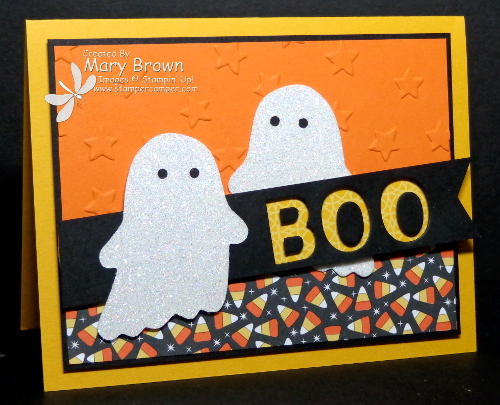 The layout on the BOO card is fabulous! LOVE your card!! And I LOVELOVELOVE that little box trio!! OhmyFREAKINcute!! Once again, you NAILED EVERYTHING, my friend!! You’re wearing me down — I am just about ready to get the ghost stamps and dies after resisting this long! 🙂 Great work as usual. Oh Mary, I love that cute little three box 3-D. Adorable for a mantelpiece!